During the month of October this year, we hear the Gospel account of the Gadarene demoniac (Luke 8:26-39). The story is familiar to us for it is read twice each year (cf. also Matthew 8:28-34). Upon arriving in the country of the Gadarenes, a Gentile country opposite Galilee, Jesus encounters a demon-possessed man who is terrorizing the people of the area. The Scriptures tell us that so violent was the man that he was kept in shackles; but in a demon-possessed fit of rage he broke the chains and went into the wilderness. Jesus commanded the demons to come out of the man. 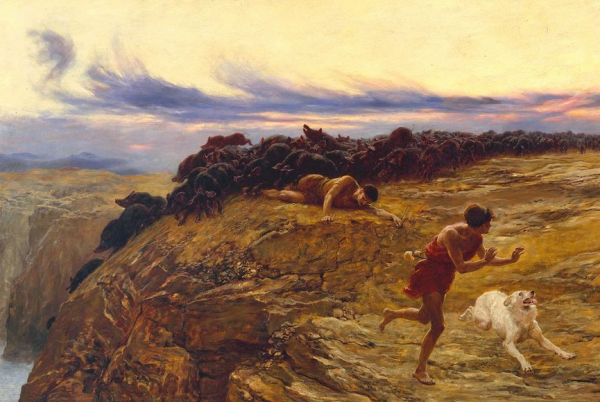 As the Gospel account relates, the demons fled into a herd of swine, Upon entering the swine, the herd “ran violently down the steep place into the lake and were drowned” (Luke 8:33). The Gospel account concludes with a group of witnesses reporting to the surrounding community what had happened. Upon hearing the report, “the whole multitude of the surrounding region of the Gadarenes asked Him to depart from them for they were seized with great fear” (Luke 8:3 7). In Matthew we are told the people begged Jesus to leave. Let us consider for a moment the response of the people to the Gadarene demoniac’s deliverance. The scriptures tell us that the demoniac was so fierce that “no one could pass that way. He obviously was a threat to the people of the area and a source of concern and fear. In casting out the demons, Jesus removed this source of danger from the lives of the surrounding people. Even so, rather than being grateful and welcoming the Deliverer, they were frightened by His presence and ability to change the circumstances of their lives. They preferred to dwell in the presence of evil than to be confronted with a power that could radically alter the circumstances of their lives. Doesn’t their response resonate with how we respond to the power of God? We often give lipservice to God claiming we desire his presence in our lives; but in reality do we want our lives to change? Like the residents of the country of the Gadarenes, are we more comfortable with living with what we are used to – be it good or bad – than encountering a Power that can change us forever? Even though God desires to change us for the good, to remove from us those things that “possess” us and terrorize us, are we really willing to change our lives? When we encounter Christ, do we invite Him to stay or would we rather He go away? Chances are we’d rather be left alone. Chances are we often are afraid that living in the presence of Christ might require some changes in our lives. So we go out to see Him, but we don’t invite Him to stay. Chances are we would prefer to struggle with our own “demons” than submit to the One who can cast them out. Just as with the Gadarene demoniac, Christ desires to liberate us from the oppression that besets us. The question is not whether He can or will; the question is are we willing to welcome the Deliverer into our lives. The people who wished Him to go away were right in one respect. If we continue in the presence of Christ our lives will change. We must remember, it is the refusal to change we must fear, not the call to it. Often times we want God to remove the burdens of our lives without requiring any change in our hearts or behavior, when, in fact, it is those very changes that affect our release from that which presses upon us. Let us not be afraid of the changes God might call us to, for in submitting to them, we will find true freedom.